Thousands of birds were discovered dead at the Salton Sea last month, raising new concerns about the lake's declining health. KVCR's Benjamin Purper has more in this feature report. I’m at the Sonny Bono National Wildlife Refuge at the southern end of the Salton Sea. There are hundreds, maybe thousands of birds here today, using the Salton Sea’s wetlands as one stop along the Pacific flyway for migratory birds. But just last month, this same refuge was the site of a gruesome bird die-off, where California Department of Fish & Wildlife workers cleaned up thousands of bird carcasses. Andrea Jones is Director of Bird Conservation for Audubon California. She says that the birds all fell victim to a contagious disease known as avian cholera. The birds are crowded because their habitat is actively shrinking. The man-made Salton Sea is receiving less and less water from agricultural run-off and the Colorado River, causing it to shrink dramatically. Tim Krantz is a professor of environmental studies at the University of Redlands, and a renowned expert on the Salton Sea. He says the shrinking sea leads to less habitat for migratory birds. That leads to them being concentrated in small areas. But that’s not the only way birds are being affected by the lake’s decline. The lake has become saltier as it’s shrunk, killing off nearly every species of fish that migratory birds rely on for food. And the lake’s shrinking isn’t just bad for birds – it’s also bad for humans. As the lake shrinks and more lakebed is exposed, the salts that were in the water go into the air. They’re then breathed in by humans. That could lead to a public health disaster as more of the lakebed is exposed. 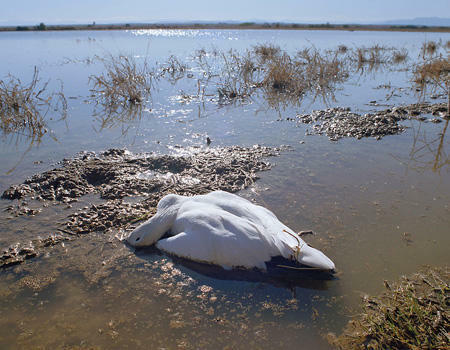 For Andrea Jones, the bird die-off is a sign that the state needs to address the issue of the Salton Sea immediately. Jones: “It's a wake up call. Or an alarm bell. We knew something like this could happen, and it's a call to action to the state to get the habitats built, that they are in the process of designing at the Salton Sea. Jones says that addressing the sea’s health is critical to both birds and humans.